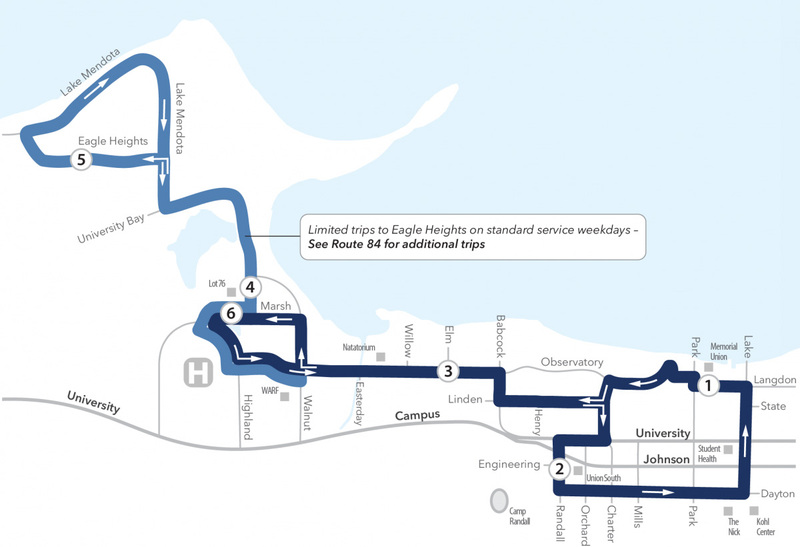 Eagle Heights, Lots 60 & 76, UW Hospital/VA Hospital, Lakeshore Dorms, Henry Mall, Union South, SERF, Southeast Dorms, State Street Mall and Memorial Union. Buses follow recess schedules when the UW is not in session. See service calendar. In effect: Saturday, Apr. 27, 2019 – 12:00 pm. * Limited trips serving West Campus // Lot 76 Ramp. # Trips operate Friday through Sunday ONLY. * Los viajes sirviendo el Campus hacia Oeste son limitados // Lote 76 Rampa. † Los viajes operan SOLO Viernes a Domingo.